Right about this time of year I start itching for a vacation. It is cold and wet where I am, so I dream of someplace warm… no, make that hot… with plenty of sunshine, good food, and great wine — A place like Santorini. 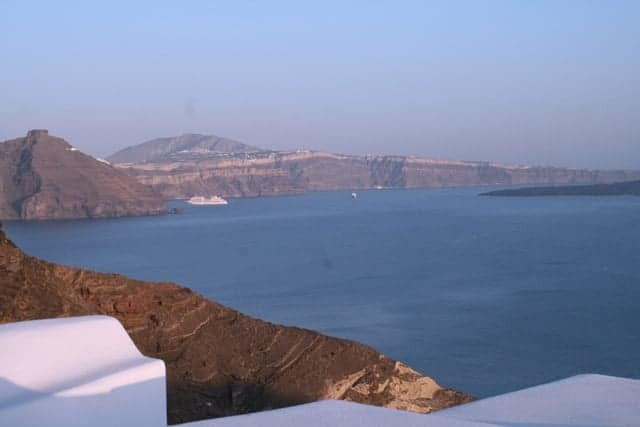 Though it may be a few years before I get back to Santorini, next time with my husband, I still look back on my trip in 2012 and can’t help but think how lucky I was for the opportunity to visit such an incredible place. Santorini is an island in the southern Aegean Sea, located southeast of mainland Greece. The unique shape of the island, a caldera, was formed by the collapse of land following a massive volcanic eruption — one of the largest volcanic eruptions in recorded history. Visiting Santorini was a bucket list destination for me, and I’m still pinching myself that I had the opportunity to go. It’s every bit as amazing as the pictures make it out to be. Between the awe-inspiring views from nearly every spot on the island, the unique architecture, to the freshest tomatoes you’ll taste, to the out-of-this-world wines made from indigenous grapes (such as Assyrtiko), it is a place like no other and should be on your bucket list too… and not just for the scenery. In Santorini a wine enthusiast can visit every winery on the island in just a few days, as there are only 10 producers on the island total. Some are more welcoming to tourists, others you will need to call to set up an appointment. Santo Wines is a large destination winery and co-op that can accommodate groups and has a grand patio overlooking the caldera from the south side of the island. It has the most jaw dropping views of any winery I’ve visited in my life. 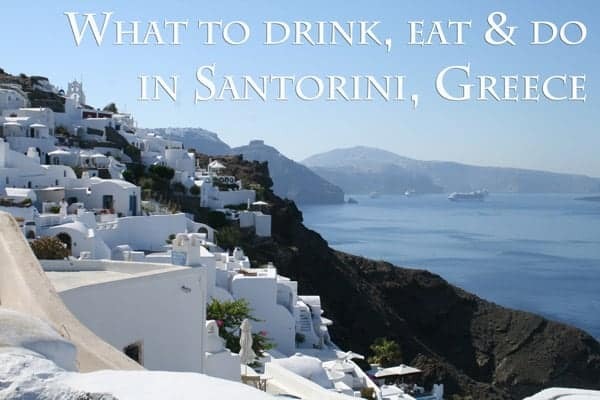 If you’re in Santorini, you have to visit for the wines, the views, and the gift shop selling locally inspired treats (I purchased locally made foods and jars of capers to bring home). 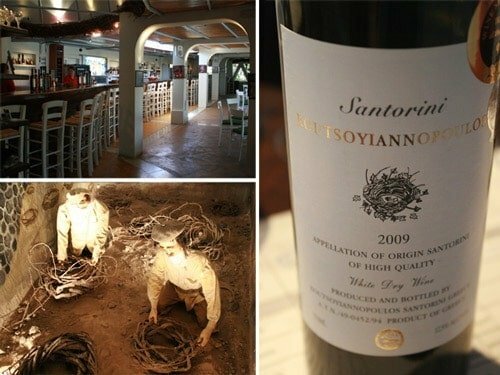 Located in a natural cave, you can visit a wine museum displaying the history of wine in Santorini dating back to the 1600’s. You’ll also have the opportunity to taste their mouth watering Assyrtiko as well as other wine offerings. Visit their website here. 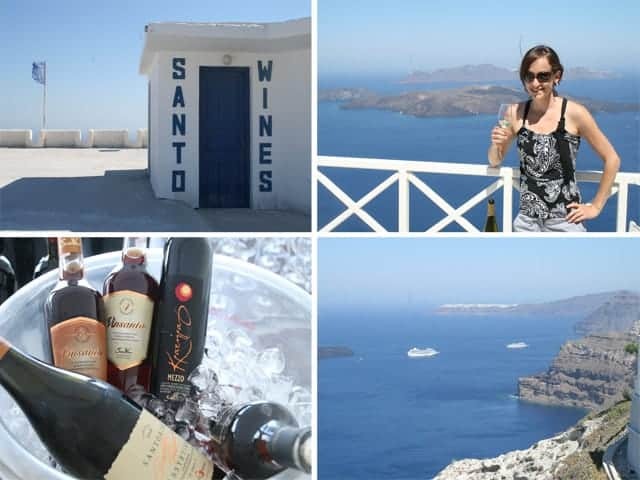 Other wineries to check out: Gaia, Boutari Wines, Domaine Sigalas, Argyros Estate, or click here for more information on visiting wineries in Santorini. 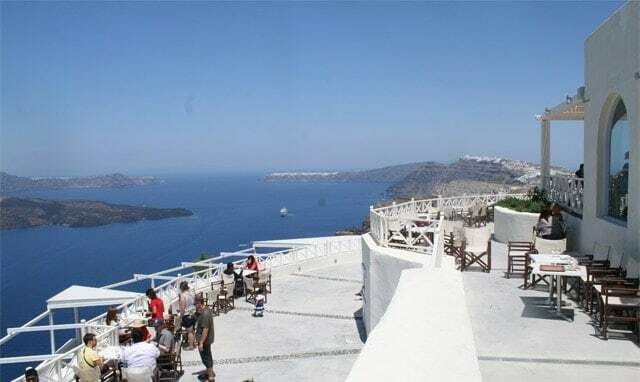 There are dozens of casual spots with great views of the caldera in Oia. Make sure to try the local salads loaded with fresh local tomatoes and capers. 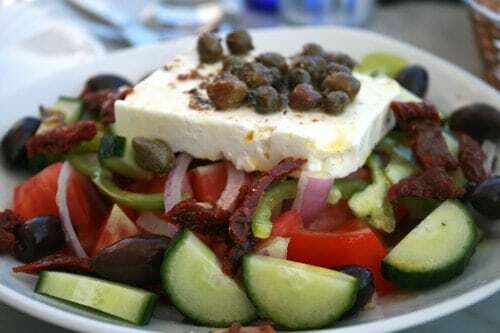 I was recently inspired to share a Greek Salad inspired recipe on my latest post for VineSleuth Uncorked. 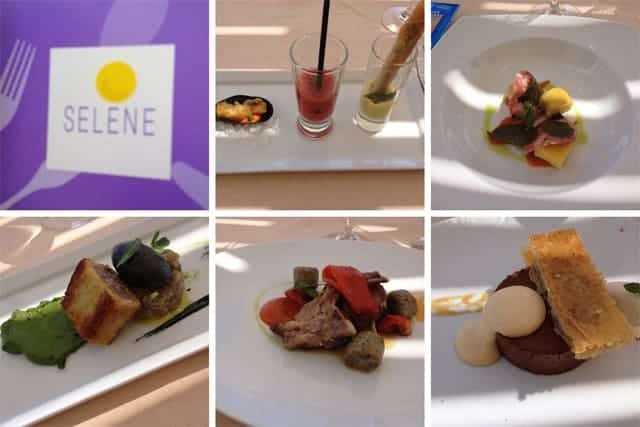 For something a little more upscale, Selene Restaurant was the culinary highlight for me. 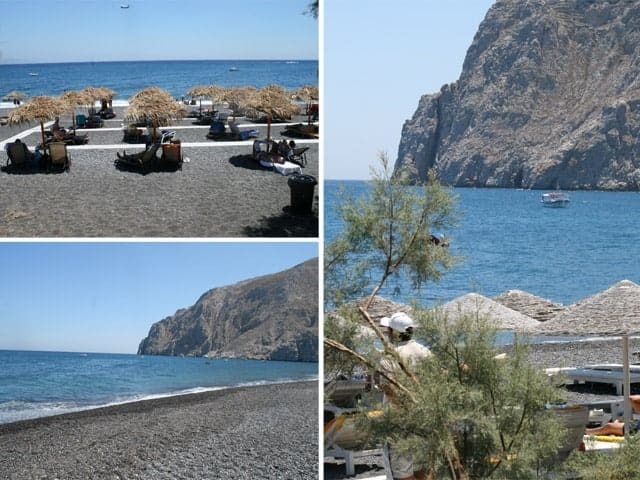 This 25-year-old restaurant moved from the city center of Fira to the small quiet village of Pyrgos in 2010 to be closer to the vineyards and the farmlands where they source much of the food for the restaurant. I had the most fascinating smoked eggplant ice cream there. Smoked eggplant ice cream!! I’m still trying to figure out how to duplicate it at home. 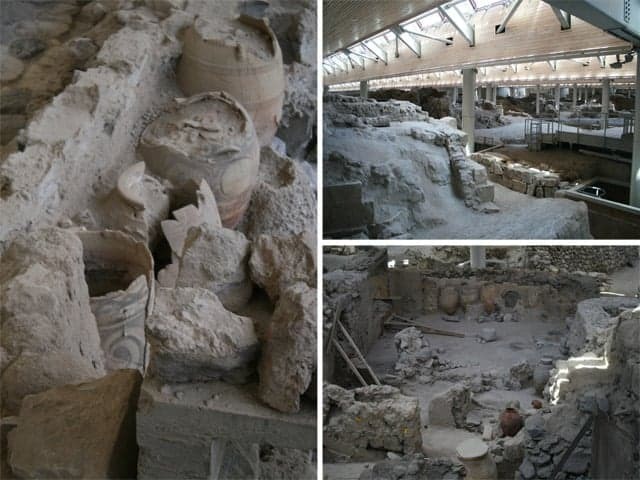 Akrotiri Excavations, an incredible archaeological site, closed in 2005 for repairs and just reopened a year ago. It was described by our tour guide as the “Pompei of the Aegean.” There you can walk along passageways and view ancient ruins that date back to a city that existed over 4,000 years ago. It’s also a necessity to check out the beaches while you are there. Duh! 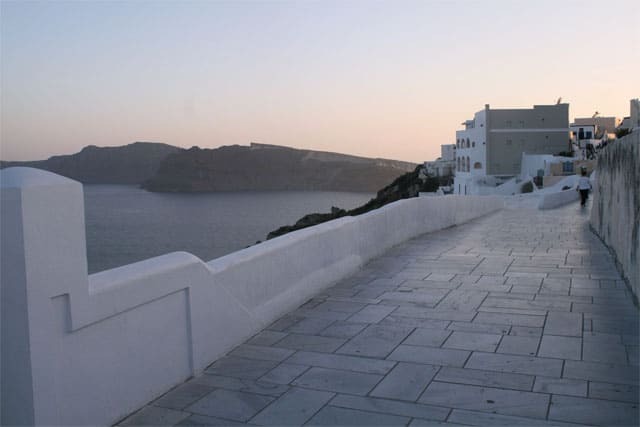 There are several hotels to stay in Oia, a great little walking town on the northern part of the island overlooking the caldera. With several shops and places to dine, this small town is also home to a spot that many refer to as the place to view the most beautiful sunset in the world (hundreds gather there every night to take that perfect shot. It makes for great people watching!). 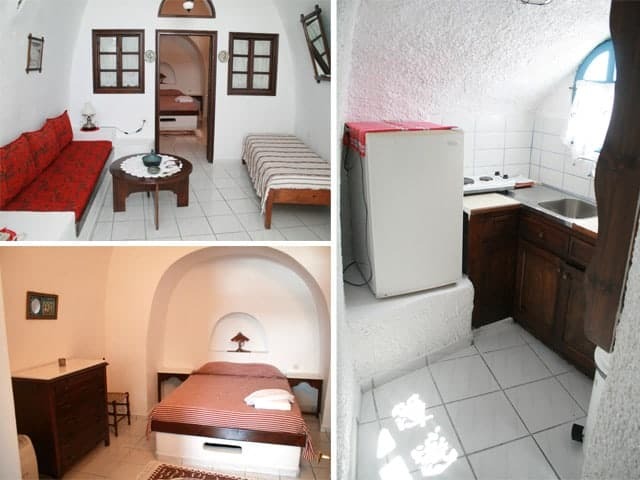 I loved my stay at Nikos Villas, with apartments and suites built into the caves in traditional Santorini style. Don’t expect international chain hotel set up and amenities, but do expect a cozy, comfortable, and unique experience with everything you need, including a small kitchen with a fridge and a casual breakfast in the morning in the lobby with light snacks. The views from the balconies and walkways are unreal. The architecture and views (from both the town and the hotel) are everything you imagine Santorini to be. And since you’re a bit of a trek from beaches in Oia, the hotel has a pool with, you guessed it, more spectacular views. 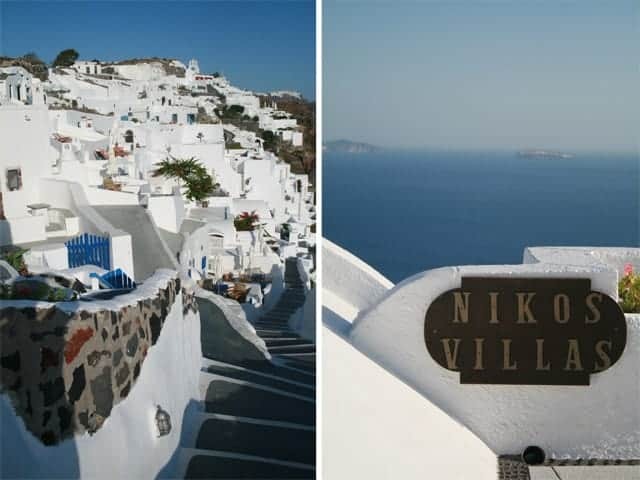 Late spring, summer, and fall are prime travel seasons in Santorini: April-June, Sept-October are optimal for mild but sunny weather, with the hottest months being July-Aug (Dec-March is not recommended for travel). This means you should jump on your computer and book your trip now! Visiting Santorini has truly been one of the highlights of my wine career so far. Those considering a visit should know that not only should it be appreciated for its natural beauty, but it is an ideal destination for the curious wine lover as well. I still fondly recall the smoked eggplant ice cream, the Greek salads, Assyrtiko, and the bluest of blues and whitest of whites in Oia. What a journey! I want to go back every single day!!! Love it so much there! These photos are gorgeous <3 You guys look like you had fun! I love those last two sunset ones. 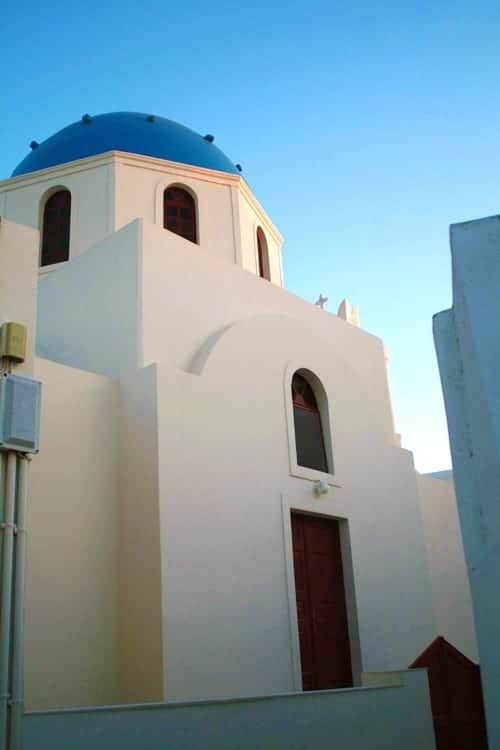 We got our wedding ceremony there http://7.agency/destination/santorini/package/luxe-wedding this summer. Thanks for your recommendations! Oh wow. What a perfect place to get married! Lucky you! !